DJI today announced the next evolution in its ground-breaking Phantom drone platforms – the Phantom 3. With two variations, the Phantom 3 Professional and Phantom 3 Advanced, this new milestone in aerial innovation provides greater control and creative options from the sky. 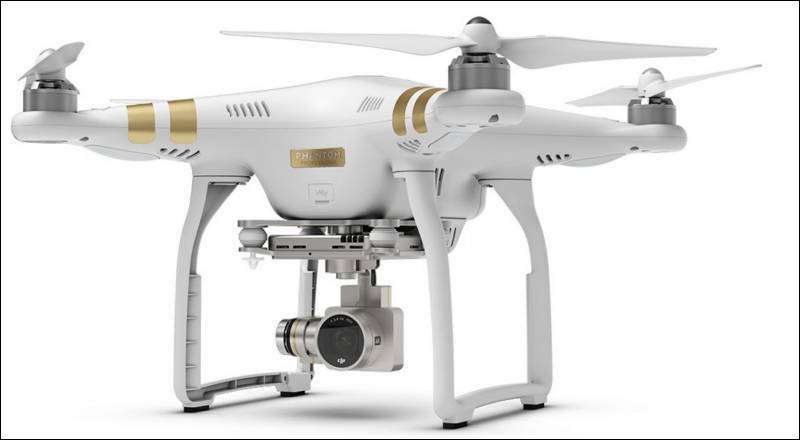 Both Phantom 3 versions feature the strongest professional control features DJI has developed so far. Using DJI’s innovative Visual Positioning system, these Phantom 3 platforms can hold their positioning indoors without GPS and can easily take off and land with the push of a button. Controllers for the Phantom 3 come paired with DJI’s Lightbridge technology, which allows pilots to see what the Phantom 3 camera is seeing in HD (720p) at a distances up to 1 mile (1.6 kilometers) with almost no latency. The Phantom 3 Professional is capable of shooting 4K video at up to 30 frames per second, while the Phantom 3 Advanced records at resolutions up to 1080p at 60 frames per second. These cameras are stabilized using 3-axis gimbals to keep the video smooth regardless of flight or wind conditions. Both models shoot 12 megapixel photos using a 94⁰ FOV, distortion-free lens, and a high-quality, 1/2.3” sensor that is more sensitive to light than the sensor in previous Phantom 2 Vision models. All camera settings, including ISO, shutter speed and exposure compensation, can be set using both the DJI Pilot app and the physical controls on the remote controllers. The DJI Pilot app also features a Phantom 3 flight simulator for virtually practicing aerial maneuvers, and a ‘Director’ feature, which automatically edits the best shots from flights into short videos that can be shared immediately after landing. The upgraded app also allows pilots to livestream their flights to YouTube. Cool stuff. I just hope the laws don't outlaw these things. now I just wonder why I should still buy a DJI Inspire, double the price, but not double the features. @jazzroy The Inspire will have the capacity to lift the speculated m43 camera system when it becomes available. That being said, I'll be picking up one of these unless they drop the Inspire price significantly or announce an upgraded camera module at NAB. I really wish I was going to NAB this year like I did last year. Would have been nice to pay a visit to DJI's booth. @deceres Steve Jobs once said "if you don't cannibalize yourself, someone else will," and that is exactly what companies like 3DR and Yuneec want to do to DJI. DJI are playing long-ball within the market to stay one step ahead of the competition, which is smart IMO. I think it's safe to say the Inspire will remain in their top RTF drone slot and will probably see a bump in value very soon, either through better available camera tech or a reduced price (or both). Besides, that's what the removable gimbal mount was designed to accommodate in the first place - an upgrade path. Btw, their hexacopter is still best choice, and they had their own camera (not very good, but) well before DJI even though about it. @Vitaliy_Kiselev Walkera is impressive and Align seems pretty interesting as well, there's no doubt it will be a hard battle for years to come. It should be great for the consumer as value will continue to grow. That being said, I think DJI's move into the camera space caught many off guard including GoPro and it's given them an integration edge and allowed them a little breathing space to keep themselves in front of the market. I think the days of flying DSLRs will probably come to an end sooner than most realize. There will always be the tinkerers & engineers who half-play and half-film with their octo-monstrosities, but who really wants to invest in a $3500 camera/lens/gimbal kit that is very easily destroyed if a poor solder joint lets go? And who wants to lug around suitcases of gear if a backpack kit can deliver nearly the same shot? I honestly think it would be better for the drone companies (and existing camera mfrs) to develop an aerial standard with USB control interface than to try and become camera companies. With a standards-based approach we'd instead get to choose a little Panasonic, Olympus or Black Magic box designed to fit a simple gimbal foot of predetermined size for auto-balance with select lightweight lenses. That would leave the real imaging tech with the pro camera companies and let the drone mfrs beat each other up over pricing, reliability claims and gimmicky flying features. You do not need one, it uses Lightbridge system, so you connect smartphone or tablet to remote and get HD picture. Anyone knows how the footage is recorded codec bitrate, etc? How is the rolling shutter at 4k? As we know, DJI is now part of M43 and we also know that the 4K camera head on the Inspire 1 is interchangeable. Perhaps we could see an M43 option for the Inspire 1? That would be one extra way it can separate itself from the Phantom 3. It's also true that you can only put so much weight on the Inspire 1 but lenses such as the Panasonic 20mm and the zoom pancake lens could be small and light enough to go along with an M43 head. @leonbeas Same camera internals as the Inspire 1, jello is well contained with proper application of ND filters to increase shutter angle. 4K bitrate is approx. 60Mbps. @PauloTeixeira I think they need a new gimbal for mft camera module too since the weight will be much heavier. I didn't like the dynamic range on the DJI Phantom 3 cam from their footage. Seems great for what it is. But dynamic range didn't seem like anything out of the ordinary. The moire was pretty bad though. And the cam's ability to resolve high detail while in motion shooting at 4k appears similar to the GoPro. Bitrate is just too low I suspect. But there's always tradeoffs. No perfect camera. Just use it for its strengths and learn to workaround the weaknesses. Pretty impressive package though, especially considering the price.